The Republic of South Africa is a state in southern Africa. It is a parliamentary democracy comprising nine provinces which is located at the southern tip of Africa, with a 2,798 kilometres (1,739 mi) coastline on the Atlantic and Indian Oceans.To the north of the country lie the neighbouring territories of Namibia, Botswana and Zimbabwe; to the east are Mozambique and Swaziland; while Lesotho is an enclave surrounded by South African territory. Wood Mackenzie estimates that 100 trillion cubic feet (tcf) of gas has been discovered in Mozambique and Tanzania to date, ranking the Rovuma Basin as one of the most prolific conventional gas plays in the world. However, there are significant technical and commercial challenges to be overcome in order to bring the gas to market by the end of this decade. These include: addressing issues around infrastructure, government capacity, financing and reaching a positive outcome to unitisation negotiations in Mozambique. Recent discoveries and high profile M&A activity in Mozambique and Tanzania are attracting attention and Martin Kelly, Wood Mackenzie’s Head of Sub-Sahara Upstream Research, says the interest is justified: “100 tcf of gas has been discovered to date in East Africa and we estimate yet-to-find reserves could be as much as 80 tcf in Mozambique and 15 tcf in Tanzania. There is clearly plenty of gas to supply the likely commercialisation route of LNG – theoretically enough to support up to 16 LNG trains. “The Rovuma basin is the most prolific in the region, and one of the hottest conventional gas plays in the world, with 85 tcf discovered so far. Globally in 2011, it yielded the third most hydrocarbons, and we expect it to top the list in 2012 if the first half of the year is anything to go by,” Kelly continues. Although there is a risk that unitisation discussions could delay Final Investment Decision (FID) – the crucial last step before commercial development – and therefore LNG production, there are other discoveries which are wholly contained in Area 1 and Area 4 and therefore gas could come from these first. Giles Farrer, Senior LNG research analyst for Wood Mackenzie comments: “Many challenges will need to be overcome prior to LNG project sanction. The region’s remoteness and lack of development present serious technical obstacles. There is virtually no existing skilled workforce and both Mozambique and Tanzania will have to build and establish deepwater ports capable of servicing the needs of the petroleum sector. On the commercial side, there is the question of government capacity – whether there is sufficient impetus and capability within the governments and national oil companies to advance the huge legislative, bureaucratic, customs and financial challenges that such a development would bring. The joint analysis by Wood Mackenzie’s upstream and LNG research teams stresses that these challenges are not insurmountable. “They have been encountered and overcome in several countries before. The risk is that delays could lengthen development schedules and add to costs,” Farrer says in closing. Wood Mackenzie: East Africa’s Yet-to-Find Reserves Hold 95 tcf of Gas| Offshore Energy Today. 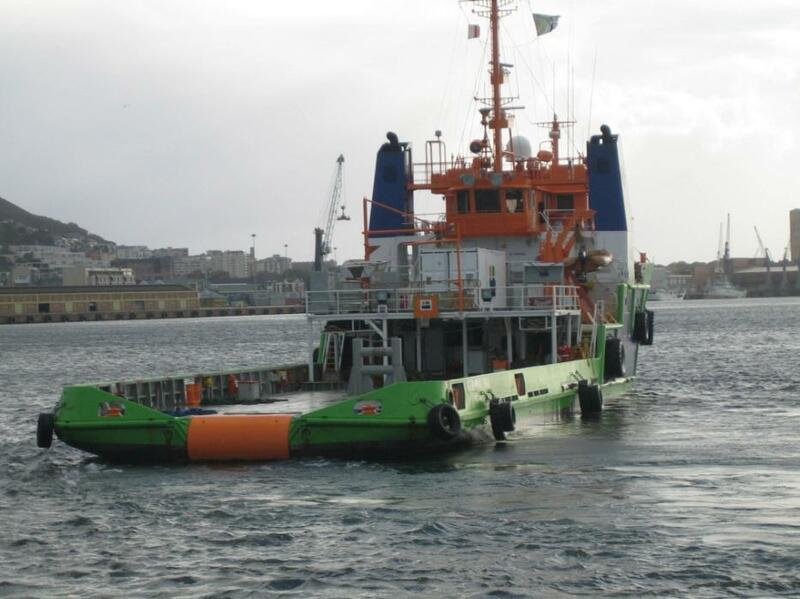 Fairmount Marine’s multipurpose support vessel Fairmount Fuji has assisted drill ship Stena Icemax while making a stop-over at Cape Town. On request of the owner of Stena Icemax the Fairmount Fuji carried out several cargo runs from the port of Cape Town to the anchorage. Stena Icemax was under way from the Far East to French Guiana and required to make a stop-over at Cape Town for crew change and replenishment. Stena Icemax is a 228 meters long new build drill ship designed for deep water operations in harsh environments. Fairmount Fuji is a multipurpose support vessel with a spacious aft deck of 280 square meters and with towing capabilities. Directly after assisting Stena Icemax the Fairmount Fuji was prepared for her next assignment in West Africa region, where she will act as a accommodation and general support vessel for an offshore operator. 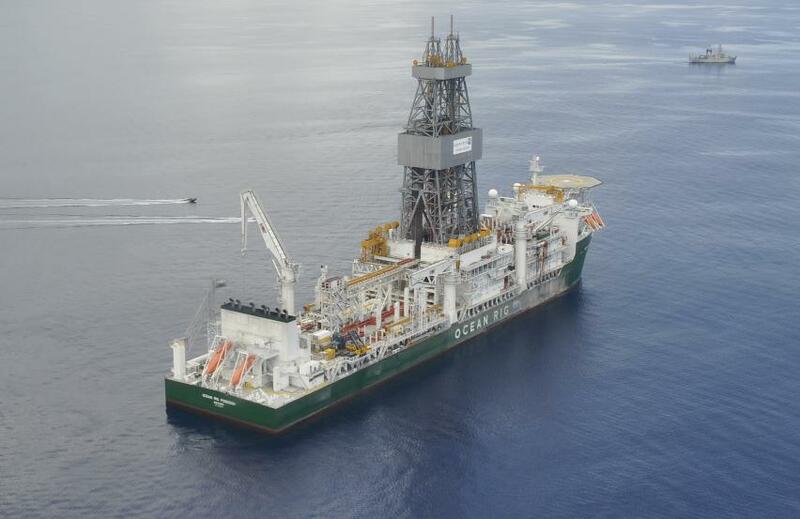 Anadarko Petroleum Corporation today announced the Atum exploration well discovered another significant natural gas accumulation within the Offshore Area 1 of the Rovuma Basin. The Atum discovery well encountered more than 300 net feet (92 meters) of natural gas pay in two high-quality Oligocene fan systems. Preliminary data indicates this latest discovery is connected to the partnership’s recent Golfinho discovery located approximately 10 miles (16.5 kilometers) to the northwest in the Offshore Area 1. The Atum exploration well was drilled to a total depth of approximately 12,665 feet (3,860 meters), in water depths of approximately 3,285 feet (1,000 meters). Once operations are complete at Atum, the partnership plans to commence appraisal activities that are expected to be followed by a drillstem testing program in the Golfinho and Atum complex. Anadarko is the operator in the Offshore Area 1 with a 36.5-percent working interest. 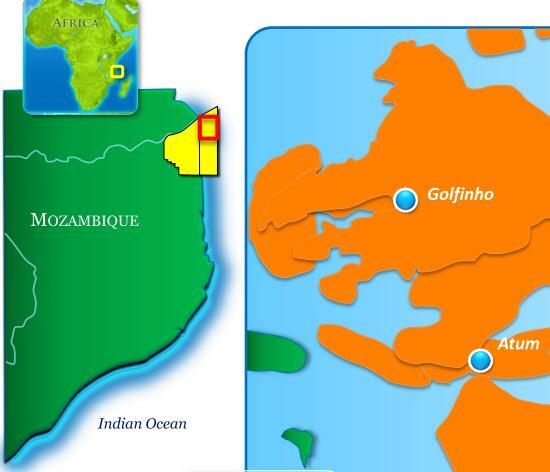 Co-owners include Mitsui E&P Mozambique Area 1, Limited (20 percent), BPRL Ventures Mozambique B.V. (10 percent), Videocon Mozambique Rovuma 1 Limited (10 percent) and Cove Energy Mozambique Rovuma Offshore, Ltd. (8.5 percent). Empresa Nacional de Hidrocarbonetos, ep’s 15-percent interest is carried through the exploration phase. Chariot Oil & Gas Limited, the Africa focused independent oil and gas exploration company, has, together with its partner Enigma Oil & Gas (Pty) Limited, reached an agreement with Ocean Rig UDW Inc. to use the Ocean Rig Poseidon drillship for drilling of the Kabeljou (2714/6-1) well on the Nimrod prospect, offshore Namibia. The drillship is expected to arrive on location in July 2012, after its current contract expires. The drilling operations will commence shortly after the arrival. The Nimrod prospect is located in the Orange Basin in Southern Block 2714A where Chariot has a 25% equity interest. The Kabeljou well is expected to take approximately 2 months to drill. The drilling location is 77 km offshore Namibia in 360 metres of water with an estimated total drilling depth of 3,100 metres true vertical depth subsea (“TVDss”). This is the second well to be drilled in Chariot’s 4 to 5 exploration well programme offshore Namibia. 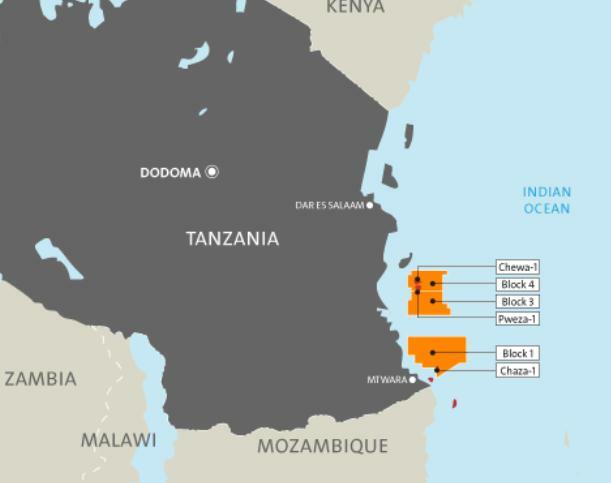 BG Group today announced its fifth consecutive Tanzania gas discovery with the Mzia-1 exploration well located in Block 1, offshore southern Tanzania. Mzia-1 is BG Group’s first discovery within the deeper Cretaceous section and opens an extensive new play fairway within the Group’s offshore acreage in Blocks 1, 3 and 4, to complement the now proven Tertiary fairway. Preliminary evaluation of the results indicates 55 metres of natural gas pay in good quality sands. An extensive logging programme has been completed, including the acquisition of pressure data and gas samples. Significantly, the well has de-risked a number of adjacent Cretaceous prospects, which could form part of a future Mzia hub. These prospects are expected to be tested in a future appraisal programme to be defined following incorporation of data from this new well and 3D seismic. The new resources proven by Mzia and the potential of adjacent prospects are currently under evaluation. Prior to drilling Mzia-1, BG Group had estimated mean total gross recoverable resources approaching 7 trillion cubic feet of gas from the four previous discoveries drilled in Tanzania. Mzia-1 is approximately 45 kilometres offshore southern Tanzania in a water depth of 1 639 metres. It is some 23 kilometres from the Jodari-1 discovery and is part of the 2012 three-to-four well exploration programme. Following the imminent completion of operations at Mzia, the Deepsea Metro-1 will relocate to Block 3 for the drilling of the next exploration prospect, Papa-1. BG Group as operator has a 60% interest in Blocks 1, 3 and 4 offshore Tanzania, with Ophir Energy plc holding 40%.